A rough terrain scissor lift is a versatile piece of heavy industrial equipment that is commonly used in settings such as outdoor construction. 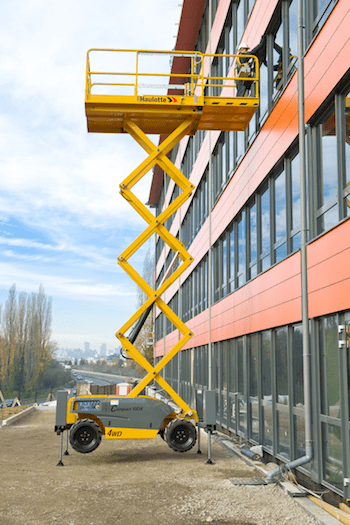 A number of variations of this type of equipment exist and it is important to understand how to determine when to use a rough terrain scissor lift, what the related safety hazards are, and what training may be required before operating the equipment. 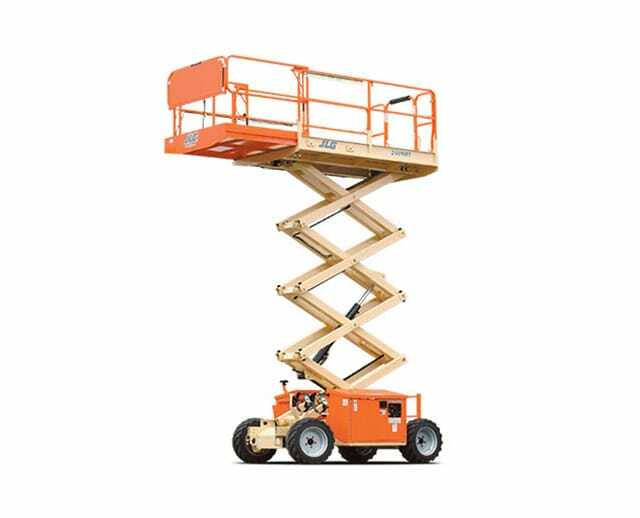 One must thoroughly consider the conditions in which they intend to use the equipment and assess all potential risks before proceeding to operate a rough terrain scissor lift. 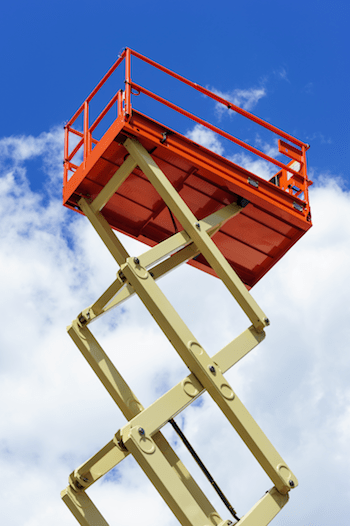 The invention of the rough terrain scissor lift is widely credited to an American inventor named John L. Grove. In 1967, Grove and his wife were on a trip that brought them to the construction site of the Hoover Dam, where they witnessed two construction workers suffer electrocution while working on a set of scaffolding. This incident led Grove to the realization that there was a serious need for providing a safer means for workers to perform their duties at elevated heights. Upon returning home, Grove formed a partnership with a few of his close friends and formed the company that is now known as JLG Industries. JLG rolled its first rough terrain scissor lift off their assembly lines in 1970 and has been a world leader in heavy-duty industrial equipment manufacturing since that day. 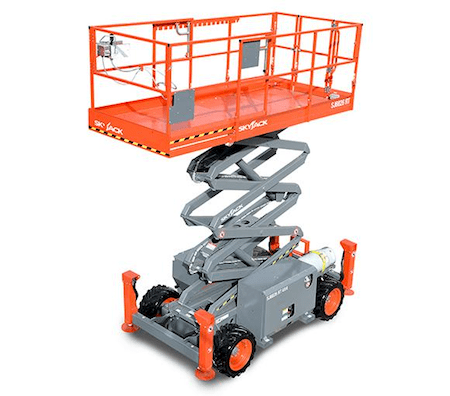 JLG did much in the way to advance the development of both outdoor and indoor scissor lifts. 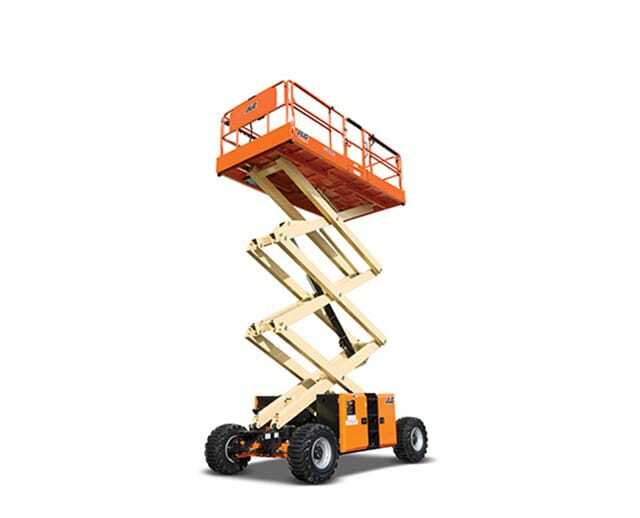 While John L. Grove is widely known as the inventor of the rough terrain scissor lift, it is important to note that an earlier model was actually introduced in 1966 by a company known as Selma Man lift. 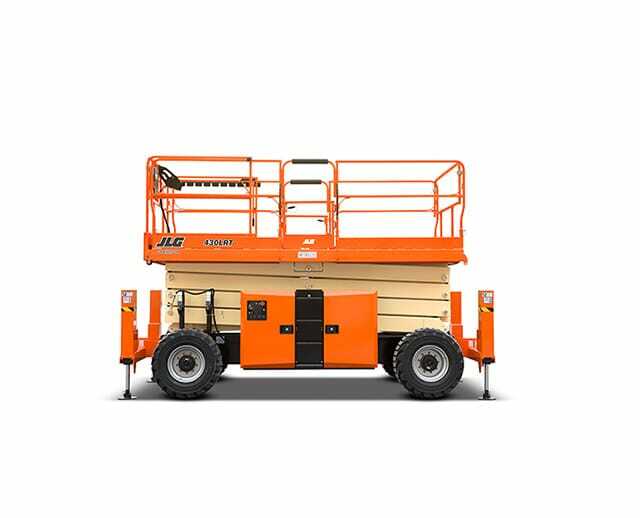 However, JLG Industries can certainly be credited for making the modern rough terrain scissor lift popular for daily use in construction, maintenance, and industrial applications. 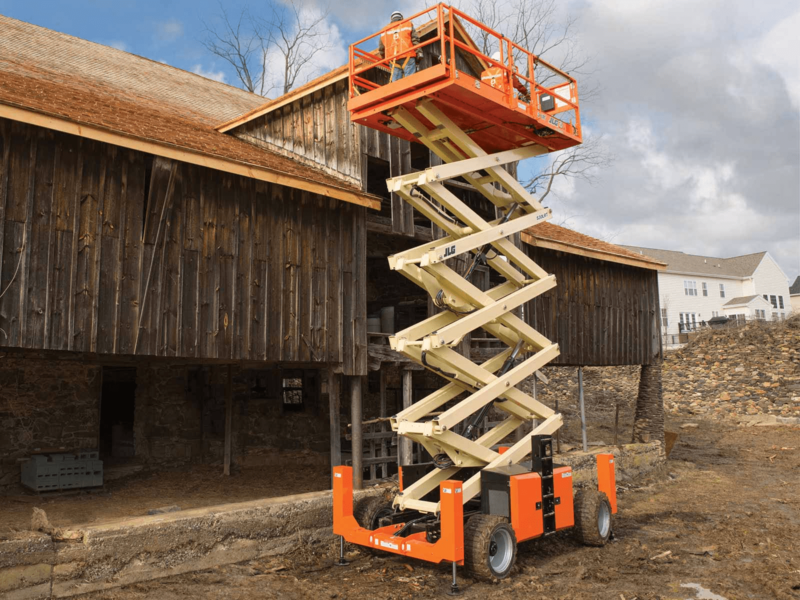 In fact, JLG Industries has been credited with designing specialized rough terrain scissor lift models for specialized work applications, making even the most hazardous elevated working conditions safer and easier to perform in. 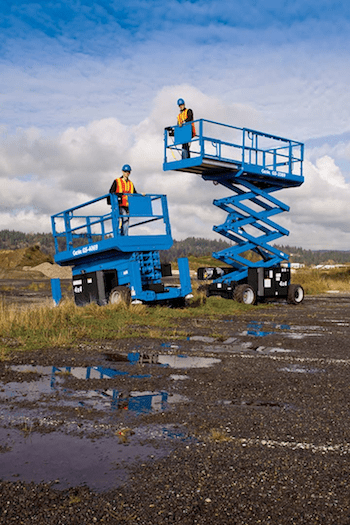 While John L. Grove may not have actually created the first rough terrain scissor lift, he is certainly responsible for making the equipment what it is today. The rough terrain scissor lift is a relatively new invention. Since its original inception in 1966, this versatile piece of equipment has undergone a number of iterations and improvements. Because the Rough Terrain Scissor Lift is still very new in terms of modern industrial technology, innovations, and improvements are still happening on a regular basis. A device called the “scissor lift apparatus” was patented in 1988 by inventors William D. Murril and Mark W. Rhodes. Design sketches for this patent show improvement on the original scissor lift's elevating apparatus, increasing overall potential work height and improving the rough terrain scissor lift's weight capacity and safety parameters. While Murril and Rhodes' original patent has since expired, their designs are widely used in most modern rough terrain scissor lift designs. 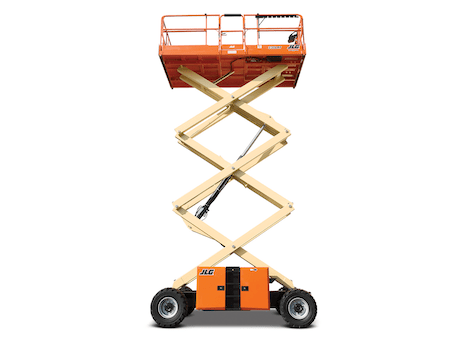 In 1992, Richard E. Cullity and David P. Engvall filed a patent for what they called the “scissor lift apparatus for work platforms and the like.” The name of their device doesn't do it justice. Building on the innovations credited to Murril and Rhodes, Cullity and Engvall were able to further improve the apparatus' height and lift capacity. This iteration makes use of a unique offset design structure that places hydraulic arms directly on the lift assembly for even greater lifting capability. Richard E. Keefer has made improvements to the rough terrain scissor lift as recently as 2001. He is responsible for a design iteration known as the “aerial work platform apparatus with anti-tipping supplement.” As the name suggests, design sketches of Keffer's innovation include safety improvements to existing designs, specifically to address tipping which, before this invention, was among the leading accidents associated with rough terrain scissor lifts. Innovations and design iterations are still in the early stages of this equipment. Expect to see many more improvements by interested parties over the next several years as safety concerns are addressed and new use case scenarios are discovered and explored. JLG Industries Incorporated was originally founded by John L. Grove in 1967. The company produced its first rough terrain scissor lift three years later, in 1970, and has been a world leader in heavy-duty industrial equipment manufacturing since then. JLG's mission is to be a world leader in designing and producing high-quality industrial machines, with a strong focus on safety and customer satisfaction. The company offers a wide variety of rough terrain scissor lifts for multiple use cases and works closely with vendors like BigRentz to provide the best equipment and training on the market. Founded in 1985, Skyjack is a relatively new heavy equipment manufacturer. However, due to the company's dedication to providing the best in industrial equipment and strong customer service Skyjack has quickly become renowned as one of the world's most trusted industrial equipment providers. Skyjack's claim to fame is their innovative and simple control interface designs, allowing operators to focus on safety and job completion without having to worry about complex equipment operation. Genie Industries was originally founded by Bud Bushnell in 1966 when he bought the manufacturing rights to a compressed-air-powered material lift. Genie partnered with Terex Corporation in 2002 and became the Aerial Work Platforms division of its new parent company. Because Genie was already such a popular and well-known brand in the industry, the lifts retained the original name and have continued to be recognized as some of the best in the industry. Today, rough terrain scissor lifts are among the many high-quality industrial equipment models manufactured by Terex and Genie. Haulotte is a global manufacturer specializing in rough terrain scissor lifts and similar aerial lift equipment. Their primary focus is on creating high-capacity, durable lifts with a solid chassis and high safety ratings. Haulotte's strong focus on equipment and operator safety has made them one of the most popular lift manufacturers in the world. Choosing the right rough terrain scissor lift will depend largely on your specific needs, working conditions, and the skill level of the person who will be using the equipment. However, there are a number of popular models that are widely used in the most common use case scenarios. Skyjack's most popular rough terrain scissor lift models include the Skyjack SJ6826 RT and the Skyjack SJ6832 RTE. These two models are very similar. The main difference between the two is the available working height. The increased work height of the SJ6832 RTE does come with a tradeoff in the form of higher equipment weight and lower weight capacity. Choosing between the two will require a thorough consideration of your exact needs and working conditions to determine the best solution. 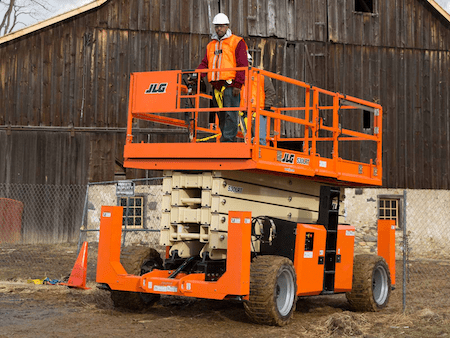 JLG Industries' most popular rough terrain scissor lift models include the JLG 330 LRT, JLG 430 LRT, and the JLG 530 LRT. Deck extension, providing more space for people, tools, etc. 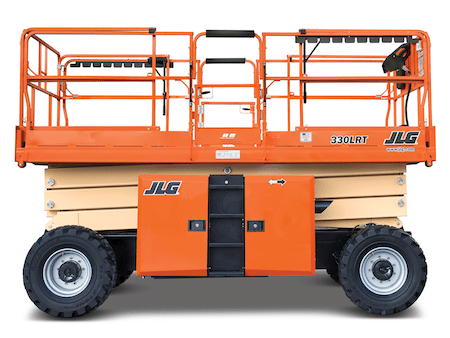 As with Skyjack models, there are many similarities between JLG's most popular rough terrain scissor lift models. The main tradeoff you'll see here is decreased weight capacity in exchange for a better platform height. The 530 LRT, in particular, may be an optimal choice if you require maximum working height or your job demands more room to safely work in while the lift is elevated. The Skyjack SJ6832 RTE is a versatile rough terrain scissor lift available in either a completely battery-powered option or a hybrid option that makes use of battery power with a traditional fuel backup. The platform has a maximum platform height of 32 ft with a 1,000 lbs lift capacity. The JLG Industries 530 LRT is among the company's models that have recently won the 2018 EquipmentWatch Highest Retained Value Award. 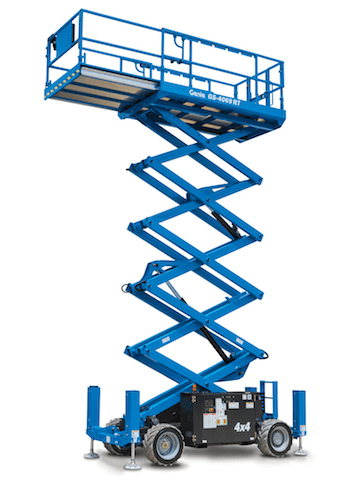 Although the 530 LRT has a larger chassis that many other rough terrain scissor lifts, the tradeoff is a much greater platform height that doesn't sacrifice much in the way of lift capacity. In fact, the JLG 530 LRT offers a maximum platform height of 53 ft with a maximum lift capacity of 1,500 lbs. That's a 20 ft height difference between the JLG 530 LRT and the Skyjack SJ6832 RTE, while the 530 LRT's larger base offers an increase of 500 lbs in lift capacity over the SJ6832 RTE. 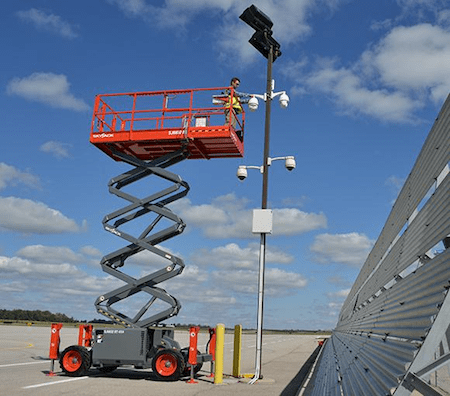 When Should Businesses Use a Rough Terrain Scissor Lift? In these cases, you will most like be better off using an electric scissor lift or another type of equipment altogether. Rough terrain scissor lifts are most commonly used in construction settings. No matter what conditions you're working under, the most common and recommended use of industrial scissor lifts is to elevate workers, allowing them to complete necessary tasks. Due to the relatively high weight capacity of most rough terrain scissor lifts, it is also generally acceptable to use equipment of this type to elevate necessary tools for a given task, although this should never be done without at least one worker on the platform to make sure items remain secure during lift operation. One should avoid using equipment of this type for any other purpose whenever possible. Accidents and injuries most commonly occur when workers become complacent and let their guard down around potentially dangerous equipment. The easiest way to avoid issues of this nature is to foster an environment of awareness and encourage safety at the work site as often as possible. When equipment of this nature is in use, it is extremely important for the operator, lift passenger, and all surrounding individuals to be acutely aware of their surroundings and circumstances. While it is impossible to completely mitigate the risk of these hazards occurring, it is entirely possible to minimize potential hazards by avoiding complacency. The most effective way to avoid a possible accident or injury while operating a rough terrain scissor lift is to make sure that all affected personnel is properly trained in safe operation. Additionally, it is extremely important to establish and properly enforce strict safety policies and procedures. Equipment-related accidents can be costly, both to the affected individuals and to the company as a whole. One should take every necessary precaution to make sure these risks are minimized. Minimizing the potential hazards associated with operating rough terrain scissor lifts is a matter of enforcing safety protocols that have been established by organizations such as ANSI and OSHA. While this may seem simple in theory, it requires employers to create a safety-focused culture within the workplace. Establishing the rules is only the beginning. One must actively and consistently encourage affected employees to continue safe operations on a daily basis. The following safety protocols should always be in place when rough terrain scissor lifts are in operation. In addition to these requirements, to avoid potential electrocution, workers should never operate a rough terrain scissor lift around live electrical wires. Proper training is essential for safe equipment operation and an employee should not be allowed to work on or around a rough terrain scissor lift unless they have attended required training for the equipment. It is also necessary to make sure you select the right equipment for the job. Not all rough terrain scissor lifts are the same and some are better suited for specific situations than others. Be sure to carefully consider your working environment in an effort to understand what type of equipment is right for your specific needs. It's not enough to establish safety procedures and attempt to enforce them in the workplace. Employees should be properly trained on safe equipment operation, with refreshers offered on a regular basis. Proper training helps to not only make sure employees are operating equipment safely, but can also help to make sure time and resources are being utilized efficiently. Even if you only plan to use a rough terrain scissor lift for a single day, the person who will be operating the equipment will greatly benefit from taking a training course related to the equipment. Question: How do I rent a rough terrain scissor lift? Answer: A number of construction equipment rental companies, such as BigRentz, have lift rental options available. Question: How long am I able to rent a rough terrain scissor lift for? Answer: BigRentz has lift rental rates for days, weeks, and months at a time. Question: How much does it cost to rent a rough terrain scissor lift? Answer: BigRentz has a number of options for you to choose from, with rates starting as low as $220 a day, $519 a week, or $1,136 a month. Question: Is training required to operate a rough terrain scissor lift? Answer: Safety should be one of your top priorities when operating a rough terrain scissor lift. Most companies will not allow you to rent their equipment until required training has been completed. In addition, failure to participate in this training may open you up to potential legal action. Question: How do I choose the right rough terrain scissor lift to fit my needs? Answer: Consider your specific needs and working conditions carefully and compare these requirements to the capabilities of the equipment you are considering. If you need help selecting the right equipment, a sales and a rough terrain scissor lift rental professional from a company like BigRentz can help steer you in the right direction. Rough terrain scissor lifts are powerful and versatile equipment, specifically suited for use in outdoor construction environments. You'll need to carefully consider your working environment when considering which lift is right for you. Proper training is extremely important when operating heavy-duty industrial equipment of this nature, so be sure not to skip this important step. If you're considering this type of equipment for your next job, contact a professional at BigRentz to help you make the right selection. BigRentz has locations all over the United States and can be reached via telephone by calling (888) 325-5172 or by email at orders@bigrentz.com.